Please login by clicking to button “Login”. This button you find in menu. Then you will be transfer to login page where you login by adding the same login informations like when you login to your amazon account. After this wizard will help you to set up everything correctly. It´s easy and extremely fast. About 5 mins job. Go to Menu next to your name. On the right side, you find Wizard button. Click it and follow instructions. Login to your account. Click in menu “Settings”. Click “My VAT IDs”. 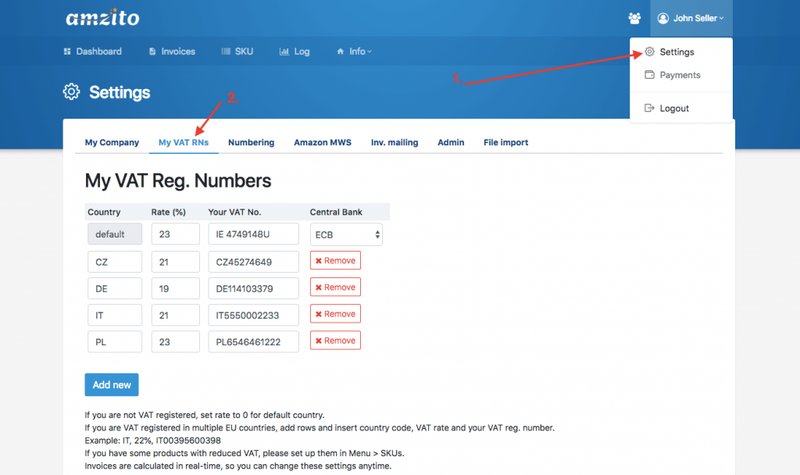 For default row, set VAT rate and your VAT number for the country where your company is registered.Insert all your VAT numbers – add rows to the table and enter your data. Choose Central Bank – if you are registered in Eurozone, choose ECB, if you are in UK, choose BOE. This is for updating currency exchange rates. In “Numbering” tab, you can setup custom numbering of your invoices. You should have registered for VAT in every country, where Amazon has warehouses and fulfil your orders from. Plus, if you have exceeded threshold of your sales to particular EU country, you are required to get VAT number for that country and pay VAT there. Log in to your account. Click in menu “SKU”. On this place you can set up VAT rate for individual product (SKU) and VAT Registration Number (VAT RN). Setting default VAT rate for VAT RN is explained above. 1. Click “Get SKUs”, then click “Get SKUs from Invoices” – if you already imported some invoices, all SKUs from those invoices will be imported to Products. 2. Click “Get SKUs”, then click “Get SKUs from Amazon” – you need to have set up MWS (Settings) to use this. Then you can import all your listed products directly from Amazon (per market). 1. 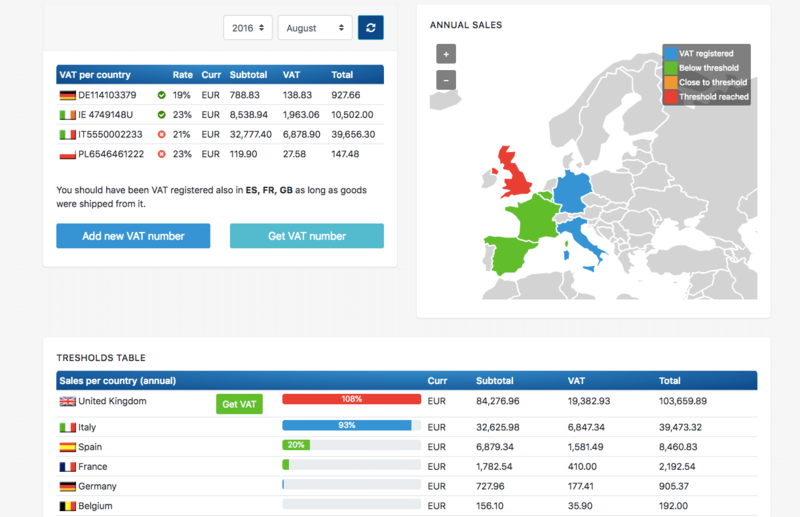 One product: Click on particular product – window will pop up, enter new VAT rate or set it to default. Click “Bulk VAT rate update”, enter VAT rate and click OK. If you have more VAT RNs and you sell books, then you need to set up VAT rate for that books to every VAT RN you have. E.g. in United Kingdom reduced VAT rate is 5%, in Germany reduced VAT rate is 7%. (2016). If you have just one VAT RN, then first table looks pretty simple. It is your VAT from Amazon revenues for particular month. If you have more VAT RNs and you sell also products with reduced VAT, table grows a bit, as you can see in a screenshot (Ireland is there in two rows, because we also sell products in reduced VAT rate). If registered, Great Britain might be there in two rows, because one customer bought our products in German Amazon market, he paid in Euros and shipped the product to Great Britain. Your accountat have to calculate VAT from that invoice from EUR to GBP and add it to GBP VAT payable (if your accounting currency is GBP, machine calculates to GBP automatically). Poland is there because Amazon pan-European FBA has a warehouses in Poland, so we should be registered for VAT in Poland as well. So again, your accountant has to calculate those euros into a Polish currency when you pay VAT. Second table shows your sales per shipping country. 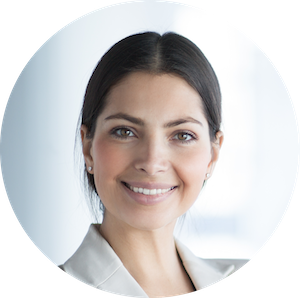 You can use it for another important information, which is, whether you did or did not touch threshold of sales in particular EU country. Once you overrun threshold, you should register for VAT in that country. The progress bar (or snake as we call it) shows you your current exposition to VAT threshold in each country you sell your products to. Red snake: you have touched threshold already and you should register for VAT. Orange snake: you have got to 90% of threshold. Blue snake: fine, you are already VAT registered in that country. Green snake: keep calm, you are below the threshold. Login to your account. Click in menu “Invoices”, then click “Analytics” or “Accountant”. Download excel file with all information your accountant needs to submit VAT report. Just filter data by year and month as you need. 1. your VAT number used for each invoice. 2. VAT rate, invoice number, date. If there have been used more VAT rates in one invoice, this invoice will be in two or more rows (per VAT rate). 3. Total, currency, subtotal, vat. 4. Buyer full billing and shipping data, including countries. 5. If buyer have his VAT RN, it is there. 7. Currency rate to your home currency. (accounting currency). 8. Total, subtotal and vat in your home currency calculated with appropriate currency rate for the date invoice has been issued. (ECB, HMRC). Your accountant can sum up figures and use it for VAT report and also for income tax, therefore s/he does not have to enter each invoice to his bookkeeping software. S/he can use that excel file as a foundation of her fillings. 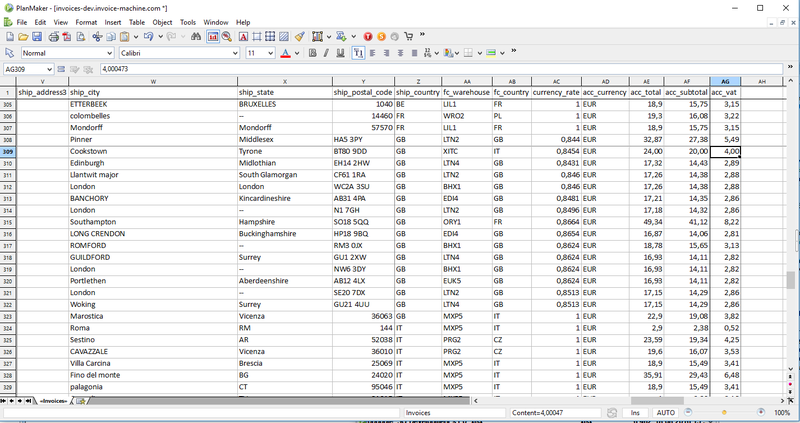 Same data but more detail you get with Analytics Excel. Enriched with columns: SKU, Product Name, Quantity shipped, Item Price, Item promotion discount. Data is ordered by VAT RN, invoice date and invoice number. Do you have any questions or need more informations? and we will provide you support. 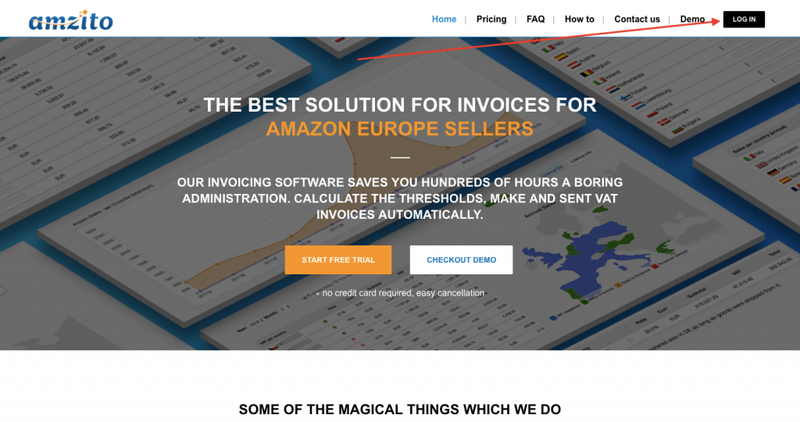 Invoice machine is software for amazon europe sellers. It creates and sends invoices with right vat rates and vat number. Everything is automatically. You can see reports of your sales and you can create reports for your accounting too. Do you need help and support? Or do you want only say hi? We’d love to be in touch with you. Cookies help us customize Amzito for you and also let us show you personalized offers and promotions. You can manage your cookies anytime. Find out more.